The 3rd International Day of Yoga (21 June) is being celebrated in Azerbaijan with a series of public yoga sessions and other events in many cities, including Baku, Sumgait, Ganja and Gobustan. 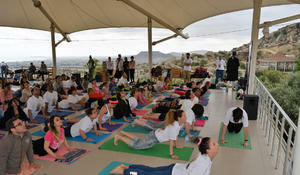 Baku will host International Day of Yoga on June 18. Azerbaijani talented dancer Oksana Rasulova has been appointed as celebrity Ambassador of numerous projects, organized in the framework of International Yoga Day (June 21) by Indian Embassy in Baku.